Loosely pronounced "poolth-WHALE-ee" is a town on the Llyn Penninsula and the end of (or beginning depending on where you start) the train line. There is a beautiful sandy beach, great walking along the Wales Coastal Path. During the summer on Wednesdays and Sundays there is an open air market held in the Square. The town is full of character with winding narrow streets, and a range in independent shops, not to mention a few pubs and cafes. 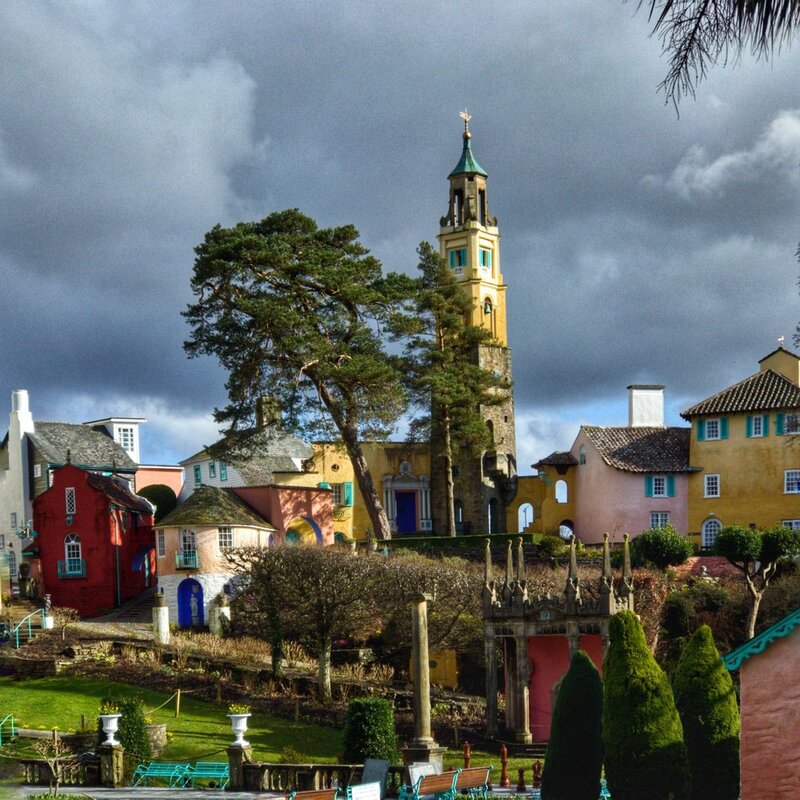 Designed and built by the architect Sir Clough William-Ellis between 1925 and 1975, in the style of an Italian village, this tourist attraction is a colorful "continental" diversion. There are lovely grounds full of buildings that seem plucked straight from the Mediterranean, and a large beach and woodland to explore. The village is comprised of spas, hotels, eateries, and shops- lots and lots of shops- selling local flair. The adult entry fee when we visited was £7.00. Only a few miles north of Porthmadog, on Cardigan Bay, this harbour town is not short on charm. Do climb to visit Criccieth Castle, built originally by the Welsh Prince, Llwellyn the Great. 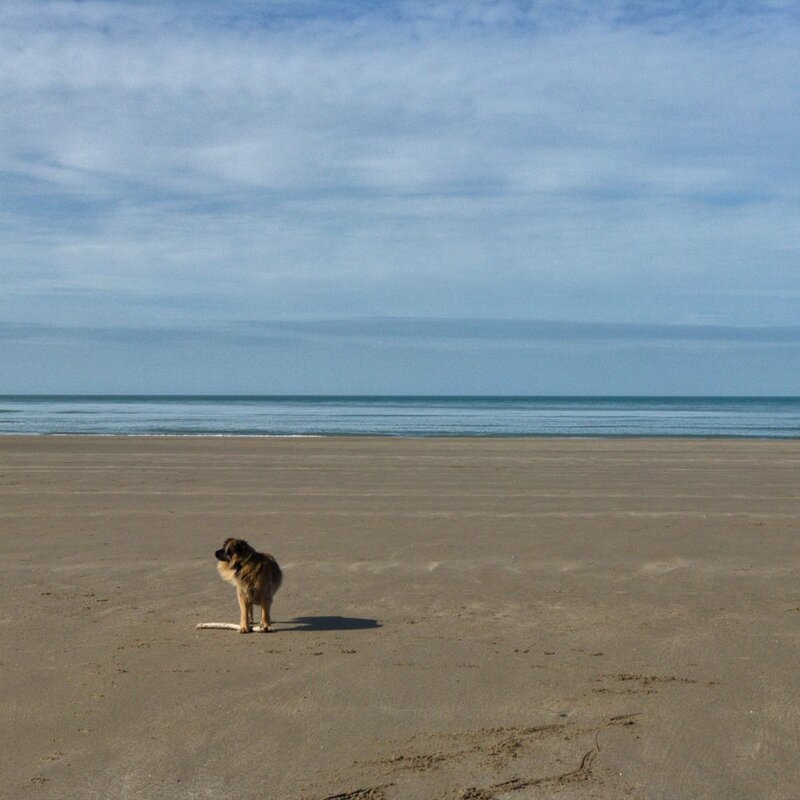 It sits on the headland with great views and is dog friendly. Criccieth also has two beaches for lovely walks (dogs not permitted after 1 April and until end of September, people are fine year round). There is a high street with some independent shops, dog friendly cafes and a couple of pubs. We loved visiting this town. Getting off the train, walking the length of the High Street and seeing the range of independent shops was a pleasure. If shopping isn't your thing, then take a walk up to Porthmadog Harbour. There is a circular walk through woodlands and shore or follow the road to Borth-y-Gest beach. You might consider booking a seat on the Ffestiniog Steam Railway to Blaenau-Ffestiniog or to Caernarfon (online booking advised). Whatever you choose to do there, you could finish the day with a pint at the Australia Pub. The food is great, it serves local Purple Moose Brewery beers, and of course it's dog friendly! This popular-with-locals seaside town feels like a carnival from the moment you step off the train. There is a big sandy beach, complete with on-beach donkey rides, a small fairground, ice cream parlours, fish and chips shops, great walks, everything that makes a typical seaside town a seaside town. Barmouth sits between the sea and the hills and it feels it feels a little bit hippy but never tacky. The Last Inn is has great food and yes, it's dog friendly. The beach itself is so vast that you will never feel cramped for space and on occasion may feel that you have it all to yourself! Pronounced "tal-SAR-nye," it's just a village with one pub, no shops, and is a request stop on the train – so why would we recommend it? Well, big things come in small packages and Talsarnau packs in some of the best walks in South Snowdonia. Walk any or all of the numerous woodland trails, bird watch at the beautiful estuary, or hop on the Wales Coastal Path to see how far your feet will take you. The scenery is stunning, the people are friendly, and the stars at night are breathtaking. If you fancy being not too far away from Snowdon and aren't worried about having amenities right on your doorstep, this is the place to go. We love it. There are probably between 100 and 200 hundred castles, including ruins of, in the UK. The best known attractions outside the UK are probably Windsor, Conway, Caernarfon Castles and of course Buckingham Palace, which are all great places. But we mentioned there are 100-200, right? It's difficult to go very far on this island without bumping into a castle, nearly all of which are of historical significance. For some of the best and most concentrated examples, the medieval castles of Wales are an imposing group of monuments, so if you are into castles, North or South Wales is the place to go. Having spent 2 months in North Wales, we very much enjoyed visits to Caernarfon, Criccieth, Penrhyn, and Harlech Castles, dating from the thirteenth century and the time of Edward I's conquest. Harlech Castle, a well preserved ruin, sits high above the cliffs of the charming village of Harlech. Also Beaumaris Castle, in the town of the same name on the Island of Anglesey. This was the last one built as part of Edward I's campaign to conquer the North of Wales, although he never got around to finishing it. It's still worth a visit if you are in the area. Penrhyn Castle in Bangor is a country house in the form of Norman Castle and worth a stop on your tour. Castles in Wales are maintained by Cadw, Wales' Government, and an entry fee is often charged to help with upkeep of these UNESCO World Heritage Sites, but many are also dog friendly so check their site for details on your specific visit. This country has so many historical sights and places of outstanding beauty, it's impossible to visit them all, although we are giving it a good try! We will be paying a visit to Conwy Castle and a few other places in a future blog, so stay tuned!